We hope this finds you well. We started the new year off with a bang and got the ewes shorn last weekend. Don’t worry, they are under a roof and most sheep are shorn in winter around here as ewes on commercial operations start lambing at the end of January. 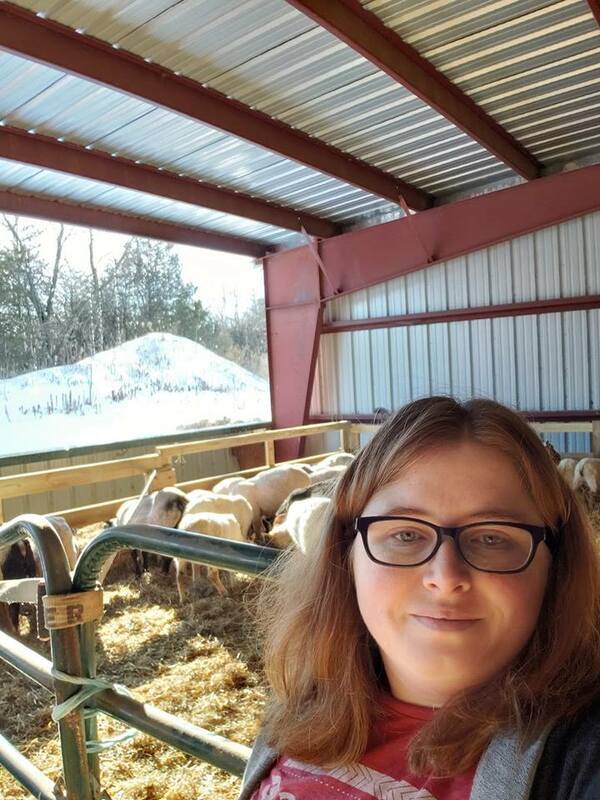 Since we won’t have lambs for a while we are in a bit of a winter holding pattern, so we thought we would take some time to reflect on what 2018 meant for us. Some of it was great, some of it less so. In what is hopefully the end of our run of freak accidents killing our rams, we lost Ramses and Bragi earlier this year. Ramses got a horn hooked on something and got stuck. When sheep get stuck in awkward positions they are very susceptible to bloat, which is a case of fatal gas. We had fed the sheep and 10 minutes later we looked over and he was dead. Bragi we think choked as again, we fed him and a few minutes later he had keeled over, this time in the middle of a field. Rams are a financial and genetic investment and we haven’t had good luck with them, here’s to hoping that this year’s boys (Chuck and Bash who were purchased late 2018) will last a little longer. We had a banner year for lambs and calves, with us hitting over 50 lambs and 10 calves for the first time. Overall we had lower lamb mortality rates this year than in the past, we think due to early lambing and parasite monitoring. We chose to keep some of the smaller ram lambs over winter and butcher them in the early summer as they will not only be bigger, it will be an easier time of year for us to market the meat. Our first year at the Westside Community Market was a resounding success, thank you so much to our customers who made it worth it. We continued to serve our friends at the Oshkosh Markets. We can’t do this work of raising wholesome food in tune with the soil and water cycles without those who believe in us providing financial support through buying our products. We are also happy that we have been able to set up a monthly meat run to Madison, Waukesha, and add nationwide shipping so that our customers can get their meat no matter where they are and we can move our non-seasonal product. Thank you, Madison, Oshkosh, and beyond! We welcomed Moss the Border Collie into our lives in March. Moss continues to teach us things every day. His herding skills have adapted somewhat to our sassy sheep and he really enjoys biting Coco’s floppy ears to get her to play with him. We also fostered Glacier, Natasha’s best friend’s cat, for 2018 and that led to the new challenge of Coco forgetting that our cat, Sheldon, was once her best friend instead of a foe. Dog-cat relations continue to be a work in progress. George the bull has adjusted well to his herd and we are very excited for his first calves to arrive this summer. His previous owner had her cows ultrasounded and he had a 100% success rate with the girls he was exposed to, so here’s hoping we have the same results! We decided that this was the year to make some infrastructure upgrades to the farm. We finished fencing the Southwest fields just in time to say goodbye to the other cattle we were custom raising. Those cows proved stressful for us and our fences so it was a welcome change. This fall we dug trenches to install permanent outdoor waterers and ran water lines through the pastures. Due to the crazy weather of this fall and winter we didn’t get it done in time for this winter, but we are excited that our days of hauling water are numbered come spring. We also plan on fencing in the East fields this year to provide grazing options for all the herds all over the farm. Jordan got very creative in his grazing, and I will write a whole post about it at some point, but there were places I didn’t ever imagine we would have cows go that had cows visit them this year. It has really been great to see how they affect different landscapes. The pigs continue to influence our landscape a lot. They reveal our laziness when we don’t move them often enough by turning the ground over in search of the best roots and bugs. Their natural tillage will help us reseed several areas this spring. We didn’t have as many piglets this year as we wanted, but Duncan the boar will hopefully be able to breed all eight sows we kept this year and then we will wish for good weather in June as we farrow. We each got to experience what happens when you are in the weigh of a pig that isn’t thinking straight this year, which gave us a newfound respect (we are both fully recovered). We are really proud of the pork product we produce and are grateful for these animals who have helped our business thrive. We hosted a pasture walk in July in the middle of Natasha’s County Fair and Tractor Pull madness. This resulted in a feature in The Country Today. We were also fortunate to be profiled in an article about sheep and soil in Spin-Off thanks to Natasha totally nerding out with their editor while at a fiber festival. The other major change has been that Jordan is teaching full-time. He has discovered his passion for working with youth and helping them figure out life while creating things in the woods and metals shop. While that has been an adjustment, it is one we are happy with. Natasha continues to love her job teaching agriculture to the next generation, and is serving on state and national task forces for inclusion, equity, and diversity in agriculture education. We are both board members for our county Farm Bureau now so we can advocate for agricultural issues that matter to us and farmers like us. Natasha also serves on the Grassworks Conference Planning Committee and the NCR-SARE advisory panel. 2018 wasn’t all sunshine and rainbows, but there were some pretty great strides. Once again we are so grateful to you for supporting our journey and choosing high-welfare, carbon/water/soil-friendly meat for you and your family. We look forward to more changes and excitement in 2019!